The 5th Sign Miracle happened immediately after the 4th Sign Miracle when Jesus fed the 5000 in a deserted place not far from the city of Tiberias. According to John, Jesus knew the crowd would try to seize him and make him a king, so he went alone to a mountain to pray. 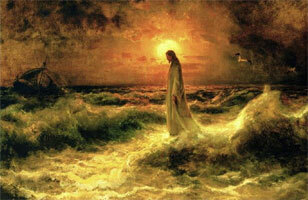 When evening came, his disciples went down to the sea, got in a boat, and departed for Capernaum. It was then dark and the sea was roused because of a great wind. Having rowed for hours, they were only about twenty-five or thirty stadia from where they started. Since the maximum width of the sea is 61 stadia, this detail confirms Mark and Matthew who both said the boat was in the middle of the sea. 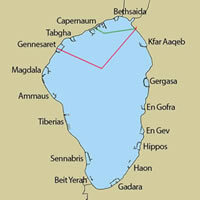 The above map shows the boat's intended course in green and the actual course due to the wind in red. When they saw Jesus walking on the sea coming near the boat, they were frightened, but he said to them, "I am, do not fear." Then they took him into the boat just as it arrived at the shore. John's version of this miracle took 11 diagrams compared to 21 for Mark and 30 for Matthew. John's diagram showing how the boat can be 25 to 30 stadia from shore is simply brilliant. The final verse showing how Jesus arrived at the land (Capernaum) to which they were going just as he entered the boat is a real surprise ending. The early orthodox church fathers may have been ignorant that every single verse in Mark and John were gematria riddles. If the Church fathers did know, they may have wanted to suppress it because the gospels already promised eternal life to anyone who believed in Jesus based on faith alone. The proof of gematria that the word of God was true just wasn't needed. This may have been one of the reasons Luke ignored the story of how Jesus walked on water even though it is still hiding today in plain view in the Greek source text in the other three Gospels. The Setting: A mountain near the shore of the Sea of Galilee. The Characters: Jesus, the twelve disciples. The Objects mentioned in the story: the large boat, darkness, the raised sea, 25 to 30 stadia, a great wind blowing, the land to which they were going.